The 2019 Audi e-tron is a 5 passenger Automatic transmission, 4x4 Sport Utility Vehicles. It is available in 2 trim packages, the Premium Plus, and Prestige. 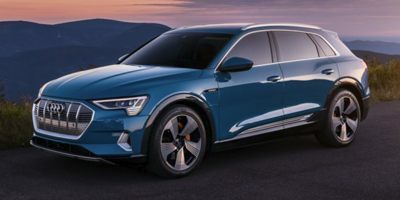 The new Audi e-tron invoice price ranges from $70,312 to $70,312, while MSRP ranges from $74,800 to $74,800. The 2019 Audi e-tron is available in 11 exterior colors, Antigua Blue Metallic, Brilliant Black, Catalunya Red Metallic, Daytona Gray Pearl Effect, Florett Silver Metallic, Galaxy Blue Metallic, Glacier White Metallic, Manhattan Gray Metallic, Mythos Black Metallic, Siam Beige Metallic, and Typhoon Gray Metallic, and 4 interior colors, Black w/Rock Gray Stitch, Okapi Brown, Pearl Beige, and Pearl Beige w/Agate Gray.